Join us on October 24 for our next WISE webinar! This month, we’ll discuss tips to help you with the first steps of any job search: writing a resume and preparing for a job interview. Our guest presenter will help you think about skills and experience to highlight in your resume and during an interview as you apply for jobs. We’ll also share advice on discussing your work experience and any employment gaps due to a disability. How do I organize and write a resume that will impress a potential employer? 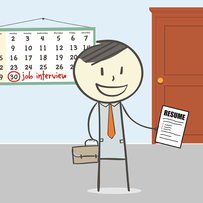 How can I feel more confident during a job interview? How can a Ticket to Work service provider help me with my job search? Register online at choosework.ssa.gov/wise or call 866-968-7842 or 866-833-2967 (TTY). You will receive a registration confirmation email with instructions for logging into the webinar. Please be sure to check your spam folder. Use our Share button to send Ticket to Work program information, job search tips and advice to your family and friends! Social Security’s Ticket program supports career development for people ages 18 through 64 who receive Social Security disability benefits (SSI or SSDI) and want to work.